When it comes to setting up your fish tank, the filter deserves major consideration, as it is the primary tool for maintaining good water quality in the tank. 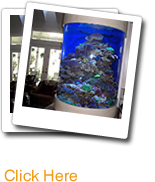 The question that often arises is, "What is the best filter for a Richmond freshwater aquarium?" With that in mind, I will briefly describe the major types of aquarium filters with a few pros and cons about each. This should give a very good base of knowledge to help with the decision of what type of filter to get. Hang on Back (HOB) Filters - This is probably the easiest filter to maintain, as it is not submerged in the tank and most come with an easily replaceable cartridge. This filter hangs off the edge of the tank so it doesn't interfere with the tank's display. Prices vary, but this style of filter is in the middle of the range. Undergravel Filters - This type works well in small to mid size aquariums. The undergravel filter promotes very good biological filtration and generally doesn't require a lot of maintenance. It can be quite a project when it does need service, though. The undergravel filter is not recommended if you want live plants in the aquarium, as the root systems will get intertwined and decrease the effectiveness of the filter. Canister Filters - Canisters are among the most versatile, yet most expensive filtration systems available. They are very popular with saltwater tank keepers because of the extra filtration steps that are sometimes required in a marine tank. Like the HOB filters, they are outside of the tank and therefore don't take up any room inside of the aquarium. Once set up, a canister filter can often go months without servicing it. This type is a solid choice for large aquariums. Internal Power Filter - As the name states, these filters go inside the tank, usually affixed to the side with suction cups. They are efficient filters and are very good choices for tanks with low water levels like a turtle or biotope tank. These filters can push a fair amount of water with their outflow, and this can be a pro or con depending on the type of fish in the tank. Box or Sponge Filters - Many a fish hobbyist has started out with this filter. The simplicity and very low cost are keys to this filter's popularity. It is powered simply by attaching an air pump, and the box filter is best suited for small aquariums. It sits in the corner of the tank so it does take up some internal space, and when it comes time to clean the filter it can be a bit of a messy process. That said, the box filter is still a good, inexpensive choice for a 10 gallon aquarium. If you are looking for a Richmond Aquarium Company, then give us a call today at 804.276.3474 or complete our request estimate form.